Struggling US electronics chain Best Buy has seen net profits plunge to just $12 million on revenues of $10.6 billion in the second quarter. Profits were $150 million in the same period a year earlier. The profit fall was exacerbated by a $91 million one-off charge, primarily related to cost of closing stores. Best Buy said uncertainty over its future sales meant it could not provide any guidance on its full-year profits. The company, which owns 50 per cent of UK-mobile phone chain Carphone Warehouse, has also suspended share buybacks. The two opened 11 Best Buy outlets in the UK in 2010, but they all closed a year later. Best Buy’s shares, which have lost almost 70 per cent since their peak of $56.66 in May 2006, fell another 4 per cent after the latest financial results. The firm is struggling to compete with online rivals such as Amazon which are able to sell goods cheaper. 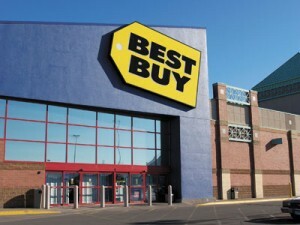 In March, Best Buy announced a major restructuring that included closing 50 stores, cutting 400 corporate jobs and trimming $800 million in costs. Sales at stores open at least 14 months fell 3.2 per cent in the three months to August 4th, including a 1.6 per cent drop in the US and an 8.2 per cent fall in international sales. This means same-store sales have now fallen in eight out of the past nine quarters. The firm said that talks with the firm’s founder, Richard Schulze, over taking the company private had broken down.